Top local government officials in Masbate province welcomed the launching of Cebu Pacific’s maiden flights to the province as they see it as an opportunity to make it more accessible to travelers and investors alike and hasten its economic development. Masbate Vice Governor Kaye Revil, in an interview Thursday, said Cebu Pacific now flies daily between Manila and Masbate four times a week--on Monday, Wednesday, Friday and Sunday. She said on Wednesday morning, she received a symbolic plane from Alexander G. Lao, president and chief executive officer of Cebgo, Cebu Pacific’s wholly owned subsidiary, to signify beginning of the airline’s operation in the province located west of mainland Bicol. Lao said the Masbate-Manila route was launched on the same day as its newest Manila-Tablas route in Romblon that utilized the newly retrieved ATR 72-600 aircraft. He said Cebgo has chosen the world’s lightest aircraft seat, Expliseat for its 72-600 aircraft. “The titanium seat installed on this aircraft is expected to help decrease fuel burn while allowing the carriage of more guests and cargo on board,” he added. Lao said Expliseat’s ultralight seats that allow for comfort seating of guests and a more fuel-efficient operation will lead to more affordable fares. Lao said their lowest one-way-all in year round fare for Manila to Masbate is PHp 1,879 while Manila to Tablas is Php 2,439. “With CEBS’s low fare offer, we hope to further stimulate inter-island connectivity and contribute to the economies of the destinations we operate in,” he said. Lao said that even if ATR 72-600 can load up to 78 passengers and can land in Masbate City airport safely, he explained that the plane will only hold a limited passenger of 69 to fly off Masbate airport because the runway condition here stills needs to be strengthened. “Maybe 5 or 10 years down the line we can look forward and it is more than possible to have jets here in Masbate if airport conditions are all set,” he said. Before Wednesday’s inaugural flight of Cebu Pacific’s Manila-Masbate route, Philippine Airlines was the only airline of choice of those wishing to see the province. Masbate City Mayor Rowena Tuason thanked Cebu Pacfic EB for its offer to fly to Masbate. "Ceb's maiden flights here will give comfort to travelers. They can now choose flight schedules that suit their needs,” she said. Revil added that this could become a chance for Masbate to compete in the market as one of the main tourist destinations in the country. She pointed out that Masbate has been promoted here and abroad as among the beautiful provinces in the country because of its rich natural resources but tourists and investors have been shying away because of its inaccessibility and steep air fare. “Air fare (of the lone air passenger carrier) was the same as when one has to fly to international destinations that had made travelers back off and opt to go to other destinations,” said Revil. 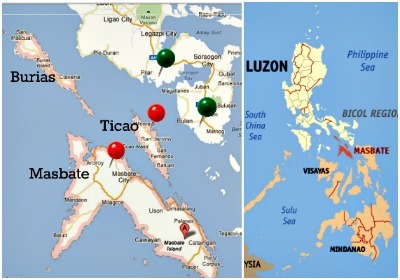 The province, which has been tagged as the country’s “rodeo capital” because of its dominant cattle industry is composed of three major islands—-Masbate, Burias and Ticao. Masbate is also blessed with wide stretches of fine beaches, rock formations and rich marine life that are largely unexplored. It is also touted as the country’s “manta ray capital” due to the discovery of Ticao Pass as habitat of the world’s biggest ray because of the concentration of planktons, making it an ideal manta ray feeding station. Revil said as Masbate becomes more accessible, investors would also have the chance to visit the province and help push economic development in the province. She said the challenge for Masbateňos and the provincial government is to ensure the “sustainability” of the new route. “It means that we all have to do our part in terms of promotions so Masbate can be considered as a major tourist destination and be able to provide a shield for investments,” said Revil. Revil said the investors should be encouraged into staying in the province. “We want them to stay here forever, ” she added. Lao said on top of offering more seats available to and from Masbate, Cebgo is the only airline flying to Tablas, Romblon, the marble capital of the Philippines. He added that both leisure and business travelers alike will take delight in visiting these two places to further stimulate trade and tourism. Lao said the aircraft ATR 72-600 delivered for this year brings CEBGO airline’s total fleet to 58. “It operates one of the youngest and most modern aircraft fleets in the world with an average of 4.92 years,” he said. Lao said the addition of the two newest routes will establish stronger cargo services within the area of Luzon, specifically in the Bicol and MIMAROPA (Mindoro, Marinduque, Romblon and Palawan) regions.